Is your Mobile App spying on you? Did you ever notice that App that you use just about every day and many times a day might be having more information about you than you wanted it to? Well chances are that it does. Your private information on your phone is surely collected and sent elsewhere without you even knowing about it. 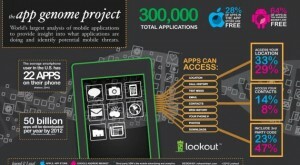 According to a recent study done by Lookout, a mobile security company, about 300,000 apps belonging to both the iPhone and the Android mobile phones were analysed. The study called the App Genome Project was an attempt to analyze just how much information is being accessed by majority of apps and being sent else where. Lookout – the security firm for mobile phones studied the apps extensively and found out that the apps were infact accessing personal data and even other phone resources without the knowledge of the user. The survey will be released at the Black Hat security conference this week in Las Vegas. The conference is to run on July 28th and July 29th. The company found that 29 percent of the free apps on Android phones access a user’s location data while 33 percent of the iPhone apps do the same. Contacts were accessed by 14 percent apps for the iPhone while only 8 percent of Android apps do so. The company also found that a particular Android wallpaper app transmitted the user’s phone number to a Chinese developer. That app was reportedly downloaded by 50,000 people. The company will release its full findings of the App Genome Project this week and also will display some of the issues that a developer might run into while dealing with security. You will surely be stunned as I was when I upgraded my iPhone 3g OS to 4.0. The camera now came with location-based picture viewing and I was surprised that the camera not just recorded the picture but also recorded where it was taken all the while! Wal-Mart’s Own Mobile Phone Service is Cheap! Previous iPad lawsuit? Class Action Lawsuit against iPad filed!